1Password for the iPhone is a tool that lets you record user names and passwords for Web sites, along with free-form notes, and store them securely on your iPhone. It shares a name with 1Password for the Mac ( ), a $35 program that makes it super-simple to not only save Web site login information, but to automatically log in to those sites in your browser of choice. 1Password for the Mac is an excellent program; we covered it briefly in this Mac Gems column from last year. Also, if you own 1Password for the Mac, you can sync your iPhone/iPod touch data with your Mac—and this works in both directions, so records can be added on the iPhone and then synced to your Mac, and vice-versa. If you approach the mobile edition of 1Password thinking it will be a clone of the desktop application, you’re going to be disappointed. The iPhone version lacks many of the features that make the Mac version so compelling—there’s no built-in secure password generator, no automatic login to Web sites in your usual browser (Mobile Safari in the case of the iPhone or iPod touch), and no anti-phishing protection via PhishTank. A Browser of Their Own: 1Password comes with its browser, but without features such as tabs, a URL bar, and search functionality. Beyond these missing features, one major limitation of 1Password on the iPhone is due to Apple’s rules that don’t allow third parties to directly interact with the mobile version Safari: 1Password can’t send sites’ login information to Mobile Safari, nor can it install a plug-in to allow it to work directly with Mobile Safari, as it can with Safari (and other browsers) on the Mac. Given the iPhone’s lack of a copy-and-paste feature, you can’t even use that method of transferring your login information to Mobile Safari—if you have hard-to-remember passwords that you rarely use, you’ll wind up writing them down in order to use them in Mobile Safari, which is hardly an ideal solution. To work around this limitation, 1Password on the iPhone includes an integrated Web browser for use with your saved login information. While basically functional, this browser has a number of limitations, including no landscape mode viewing, difficulties in accessing sites that use basic access authentication, and the fact that you can only browse one site at a time. (You can’t open more tabs or pages.) Beyond the technical issues, however, there’s another problem: using two different browsers on the iPhone is inefficient. To use 1Password as intended—to help you login to password-protected Web sites—you need to use its browser for such sites. But you would probably still use Mobile Safari for all your other sites, as it has a nicer feature set (and it’s what will launch when you click links in other iPhone applications). As a result, you would wind up using both browsers regularly, and having to flip between them depending on which site you wanted to visit—a far from ideal solution. I found myself rarely using 1Password’s built-in browser, and instead just using the program’s ability to store my confidential data. Overall, when compared to the site login functionality found in the Mac version of 1Password, the mobile touch version is disappointing—somewhat due to the state of the version 1.x software, and somewhat due to the limitations that Apple places on third-party programs on the iPhone. While many of the shortcomings of the software will undoubtedly be addressed by updates, the biggest problem—requiring an integrated Web browser to use saved login information—won’t be resolved unless Apple changes the way third-party apps interact with the mobile device’s default browser. So if 1Password for the iPhone isn’t a great tool for logging into Web sites automatically on the iPhone, how well does it work as a secret-keeper application? Judged on its own merits, 1Password is a decent, but not great, way to securely store private information on your mobile device. Your data is encrypted, and then locked behind a four-digit top-level password, as well as a master password that can be required on a per-record basis. Unfortunately, when using the iPhone version of the program, the only types of data you can store are Web site logins and generic notes. The programs I covered in the recent secret keeper round-up, which range in cost from free to $30, all offer more flexibility in terms of the types of records they can store, as well as their feature sets. When paired with 1Password on the Mac, though, the combination of the two programs yields a very good secret-keeper solution for your iPhone or iPod touch, as well as the best auto-login solution available for the Mac. (Sorry, Windows users, the desktop version of 1Password is a Mac-only application.) The desktop 1Password allows you to do two things that greatly increase the usability of 1Password on the iPhone: create wallet records, and sync your data with the iPhone version of 1Password. What’s In Your Wallet? 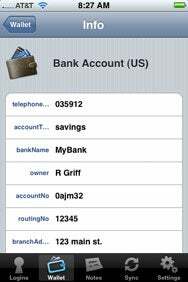 With the help of the desktop version of 1Password, you can create wallet records to store on your iPhone. On the Mac version of 1Password, wallet records store bank accounts, passports, credit cards, software licenses, and other data. While these records lack some of the flexibility available in the programs in my original round-up—you can’t add new types of records, nor modify field names, for instance—they do cover quite a wide range of data types, and should meet most anyone’s needs. Once created, wallet records (along with your Web site logins and notes) will sync with the iPhone version of 1Password, where they can be viewed (but not modified or created). Once you’ve set up all your data using 1Password on the Mac, including your wallet records, you use 1Password on the iPhone to initiate a sync with the Mac. Your iPhone must be on a Wi-Fi network, and it can only sync with a Mac on that same network. The first time you sync with a Mac, your iPhone displays a secret code that you must then enter in a dialog box on the Mac. Without the proper code, no sync takes place—this effectively prevents anyone from syncing and stealing your secrets without your knowledge. In my tests, I never had any sync issues—the Mac and the iPhone saw each other, and the data transfer was both speedy and accurate. If you do have issues, however, there are many sync solutions suggested in Agile Web Solutions’ Everything you need to know about 1Password for iPhone support document. 1Password for iPhone is a difficult product to review. On its own merits as a secret-keeper application, it doesn’t fare well based on its feature set, implementation, or in comparison to its competition. If you’re looking for a secret-keeper application solely for your iPhone, there are better solutions available. As an auto-login tool, Apple’s restrictions on working with Mobile Safari lead to a clunky implementation that requires a somewhat feature-limited embedded browser. However, when you combine 1Password for the iPhone with its Mac counterpart, the two programs work quite well together as a secret-keeper solution—and on the Mac, as a great auto-login tool for use with many popular browsers. Using the desktop app, you can create wallet records, which are used to track many types of generic secret data, which you can then sync to your iPhone. While you still won’t have the ability to create these records on the iPhone, you will have your full secrets database available for browsing on your iPhone. Given Apple’s restrictions on inter-application communication, I still wouldn’t recommend using 1Password for iPhone as a Web site login tool—the limitations of the current bundled browser make it a relatively poor replacement for Mobile Safari. But as a general secret-keeper solution, the combination of the desktop and iPhone versions of 1Password is hard to beat. At $35, it’s only $5 more than the combined cost of SplashID ( ), the highest-rated app in that round-up. For that added $5, you get an excellent Web site login tool that nothing else on the Mac can match. When used together, the two versions of 1Password make a good team. 1Password is compatible with any iPhone or iPod touch running the iPhone 2.0 software update.